Review summary: Excellent print quality for documents and photos, above average scanning and copying speeds and easy operation make the HP Photosmart 7520 the best multifunction printer under $200. A multifunction printer (MFP) or "all-in-one printer" is one of the cornerstones of a home office. These workhorses do everything – from printing documents and photos, to copying, scanning and even faxing (yes, some people still fax). When searching for the best MFP, my pick had to do all those basic functions well. But there were other important criteria to add to the list. The best MFP had to support wireless printing from my mobile devices, have a relatively small footprint, an Auto Document Feeder and support duplex printing. And, the printer had to have strong reviews by both pro reviewers and the consumers who’ve purchased them. And it had to do all that at an affordable price. I settled on a $200 limit as the amount most people would be willing to pay for a home office MFP. 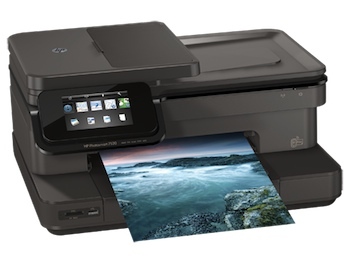 Those criteria narrowed out the list to four contenders: the HP Photosmart 7520 ($149.00 on Amazon), the Epson Expression XP-810 ($149.99 on Amazon), Canon PIXMA MX922 ($99.99 on Amazon) and Brother MFC-J870DW ($130.59 on Amazon). After setting up and testing all four models, I chose the HP Photosmart 7520 as the best multifunction printer under $200. It has excellent print quality for documents and photos, above average scanning and copying speeds and is very easy to use. Let me say right up front that all of these printers took way too long to set up. They all needed software and/or drivers to be loaded onto my computer via an included CD or downloaded from the company website. Some of them make you switch back and forth between reading messages on the printer and your computer screen during setup. The Brother took well over an hour to complete setup. Epson’s CD load time was shorter, but setup was wonky; I had to re-enter my info several times before it completed the process. I tested these printers using a laptop running Windows 8. HP did a great job walking me through set up, beginning with installing the ink cartridges. Not only are they color coded, each has a shape on the label that matches a shape on a slot inside the machine to show which one goes where. If you need more help, there’s a short animated tutorial on the touchscreen of the front of the printer that guides you through. Setting up the wireless connection was not always easy and some printers were more difficult than others. The Epson CD stopped short of setting up the WiFi so I had to use the controls on the printer’s screen, which took a few tries as it was looking for a USB, not wireless, connection. The Canon made me type in my network password on the tiny touchscreen keyboard – twice. Overall, my experience setting up WiFi on the HP 7520 was the easiest and least complicated and it connected to my home Wi-Fi right away. While we’re talking about Wi-Fi, I should point out; if you’re looking for a wireless printer to use with an iPad or Apple product, any one of these will work just fine. Each time I connected a printer to my home network and then opened up my iPad, the printer appeared. AirPrint worked every time. If you are using an Android device, setup is far more complicated. It requires connecting the printer to Google Cloud print as well as downloading the individual printer app. But it’s not just a matter of two steps instead of one; the whole connection process is more difficult, with the HP 7520 again being the easiest of the bunch. These printers, with the exception of the Brother which uses a 4-cartridge ink system, use a 5-color ink system with four colors (Black, Cyan, Magenta, Yellow) and a high-capacity black for printing text. This way you only need to change the ink cartridge that needs replacing and, for the most part, inserting the ink was not terribly difficult. The paper trays on the HP 7520 were the most user-friendly and the only one I didn’t feel like I was going to break a nail trying to open. In fact I was able to just slide paper into the 8x10 path, rather than having to pull a tray all the way out. It holds 125 sheets of paper, slightly more than the 100 sheets of the Epson XP-810 and Brother MFC-J870DW. The Canon MX922 gets high marks for its 250-sheet capability, so you don’t have to reload as often, but when you do, opening the tray was difficult and often made me feel I was going to break it pulling it out. All of these have a secondary paper tray for holding 20 sheets of 4x6 sheets photo paper. If you print very large documents for work, printing in reverse order is a must-have. All these printers let me reverse the order of a document, but the HP 7520 and the Canon let me change that to a default setting rather than selecting it each time I printed. HP places the SD card slot as well as the USB port right up front on the printer, something I appreciated so I didn’t have to turn it around or fumble blindly to access those ports as I did with other printers. And, to make remote printing easy from any device anywhere, the HP Photosmart 7520 features ePrint technology which assigns the printer an email address that you can personalize. This means you can send print jobs from any connected device, as long the printer is turned on. So, for example, if my sister wanted to share a document with me, she could email it right to my printer. I can also send something to the printer from an out-of-town business trip. No worries about spam, you control who can email your printer. If you’re looking to print your own photos at home, a multifunction printer is a huge convenience. In less than two minutes, all of the printers will print a borderless 4x6 photo from your computer, mobile device or external device, like a USB drive or SD card. In terms of quality, the Canon printed the blackest blacks and brightest colors with full saturation. The HP and Epson, though, had very good print quality. The only outlier was the Brother. I had some issues with the Brother’s photos; they were not as vibrant and some printed with streaks across the prints. Where the HP shines is its ability to recognize when I’m printing a photo and then automatically pull from the correct tray. With the other printers I had to tell them what I was printing (photo or document) and, in some cases, I had to physically slide a lever to switch trays. Speed varied on these printers and I was quite pleased with the output of the HP 7520. I was able to print 10 single-sided pages of text in 0:58. The Epson took 1:03, Brother 1:23 and the Canon clocked in at 1:44. Not a huge difference but when you copy and print a lot of documents for work, speed matters. Text quality on the HP was crisp and dark, even when I used smaller fonts. I was able to print graphs in bright, accurate colors and an 8x10 print of a color photo on plain paper was a close enough representation without getting blurry. Though document print quality was pretty equal across all models. If you tend to do a lot of document scanning, like I do, you’ll appreciate having a printer with an automatic document feeder (ADF). All models operated in pretty much the same way. They can hold around 20 – 35 sheets of paper and have a duplex scanning mode. On all these printers, I was able to scan a document to my PC and save it to a file or send it directly to an email as an attachment. However, the process was the easiest with the HP. It let me initiate a scan directly from the printer and choose where I wanted to send it right from the touchscreen. The Canon made me initialize the scanning software on my PC and initiate the scan that way, as did the Epson since it had lost the wireless connection. For one test, I made a copy of a color flier with both images and text. The Canon and the HP printed superb reproductions with marginally perceptible loss in color. The text was near perfect, though the HP was a darker black which made it slightly easier to read. Each of these printers comes with a built-in fax capable of delivering both black and white and color copies. The speed varies just a bit; about 3-6 seconds per page, but unless you receive a lot of faxes, this isn’t likely to make a huge difference in choice. Memory also varies; the Epson can store 180 pages in memory while the Canon holds 250 pages. The clear winner in this category is the user because whichever you use, I’ve found built-in faxes to be a whole lot easier to use than the eFax services I’ve tried on older models. I set out to find a printer with a small footprint and in the end, that wasn’t the one that won me over. If you’re looking for the smallest, most compact printer for a home office, the Epson is the clear winner. Epson’s footprint is small and compact and doesn’t take up much desk space. The adjustable touchscreen folds in to present a flat front. On the other end of the spectrum, the Canon seemed like a small spaceship sitting on my desk. It was tall and wide and when the output tray popped open, it extended another 5-6 inches into the room. Brother’s footprint was wide, but still relatively low. The HP 7520, though not the largest of the bunch, is almost as tall as the Canon but it appears smaller because it’s not a solid design; there are some open spaces and the large touch screen on the front tilts to accommodate any viewing angle. While the ADF on top adds extra height to the unit, it wasn’t enough to knock this out of first place for me. Consumer Reports (subscription required) rated all four of the models I reviewed and the HP Photosmart 7520 came out on top by a fair margin. “Color photos…are top tier for an inkjet MFP, which makes them better than what you'll get from most drugstore prints. The printer even did a reasonably good job with black and white photos on my tests, which is what inkjet printers most often have problems with,” states PC Mag. 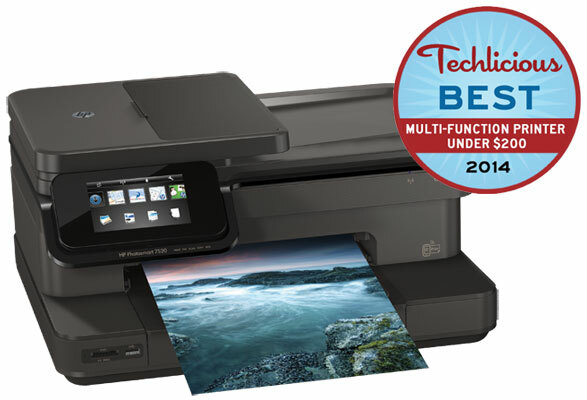 Overall, the HP 7520 received a solid 3.6 out of 5 stars on Amazon. The other contenders came out slightly higher at 3.8 stars for the Epson XP-810, 3.9 stars for the Canon MX922 and 4.1 stars for the Brother MFC-J870DW. From a product reliability and setup standpoint, consumers were complimentary of the HP 7520, though there were complaints about ink costs. And this is understandable. Printer manufacturers are able to sell us the printers so cheaply because we are then forced to buy very expensive replacement ink, and that’s a strategy all the manufacturers employ. However, according to a study by Consumer Reports, the HP, Epson and Canon printers use a higher quantity of ink for “maintenance tasks” (e.g., cleaning print heads) than Brother. So you may find your cartridges running out faster than you expect based on how much you’re printing. Does this make the HP more expensive to operate than the Brother? Not necessarily. Because when you consider the cost to print a 4x6 photo (a very common printing task), the HP is slightly cheaper, while b&w text documents are slightly more. So where you net out depends heavily on how often you print and the breakdown between photos and text documents. All of the printers I tested were reliable printers that will do a solid job at copying, faxing, scanning and printing photos. Some performed certain tasks slightly faster or better than the others. But in the end, the HP Photosmart 7520 was superior in most of the qualities I was looking for, making it the best multifunction printer under $200. I have an hp photo multi purpose printer and I am FOREVER buying ink. I could have purchased 500 printers at the cost of the ink for the HP printer I own. How many pages will this print in color before you have to replace the cartridges? That would be the test for me. However, actual usage will be a lot lower if you don’t use your printer often because it will lose ink due to evaporation and nozzle cleaning. Consumer Reports estimated the monthly printer ink cost for the HP 7520 based on “typical” usage is around $6.40 - roughly in-line with the other printers we reviewed. If you’re only getting around 5 pages of printing, something is wrong with your printer. Especially, in printers under $200, I think most people have caught on to the fact that the manufacturers really make their profits on the ink that is used by these machines. While I realize this is not a consumer advocate, long-term evaluation, I think it is something of a blunder to fail to mention manufacturers’ ink usage claims, at the very least, and include that as a factor in your evaluation. The vehemence you have incited is likely due to your choice of an HP printer. I also remember spending hundreds of dollars on ink on HP’s excellent printers. I ended up giving one away. Another excellent printer, I threw away because it was less expensive to buy a new printer than to buy ink. I cannot argue the nice quality, but at what price? How do the printers compare on cost of operation, something a buyer of a printer under $200 might like to know? We simply don’t know. Long-term owner experience is very important to us, which is why we consider Amazon ratings in our reviews, something few other professional review sites do. We did consider the ink costs and discuss it in the section above “What consumers think”. However, this is something that is very difficult to quantify since it will vary considerably depending on your specific usage (e.g., B&W vs photos, frequency of printing, and even how often you turn your printer off and on). Consumer Reports did an excellent study of ink costs which included the models we evaluated. The net-net was that “typical” owner costs are roughly equal for all four models at around $6 per month. We didn’t consider manufacturer claims as most don’t provide usage estimates and there is no industry standard for measuring “real” ink usage. 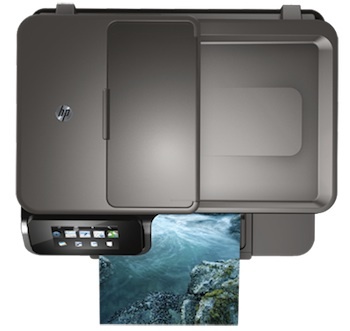 I’ve looked at several reviews of the HP Photosmart 7520 and nobody talks about the cost of the ink. That is a critical factor when comparing printers. In many cases, it feels like manufacturers are giving the printer away for free and making all their profit on the ink cartridges. Why haven’t you looked at that factor? Almost ALL color printers use SOME color ink even when printing a page in black and white. Simple tip: always select draft mode and monochrome when printing simple stuff, like your grocery list, kids chores, etc. You will find your color ink lasts much, much longer. Hope this helps. I had used HP multi function printers for the last 12 years and they all ended up failing me and being too expensive to repair - so I bought another HP MF to replace the one that failed. Five HP MF printers later - and with zero confidence in HP tech support, I bought a Brother MFC J475DW for under $100 six months ago. As well as scan, fax and copy, it supports wireless printing for two PCs and I have had no problems at all. The ink usage is much less than HP and if set on the ink saving mode, even more so. Adios HP - I’m with Brother now! As with most of the newer printers there are aftermarket ink sources available. There are the refillable cartridges and the bulk inkers that attach to the printers externaly (some better looking than others). The quality of these inks is equal or better than the OEM. Using these will save a LOT of money but they will VOID your warranty. Modern printers rarely fail within the warranty time so this is a viable option. Depending on your ink usage, you may save enough to buy a new printer monthly. The set of replacement ink bottles (4 colors) costs less than 1 standard OEM cart. You can also buy by the gallon to save even more. Ink itself is realy cheap. We have a Brother MFC-J6710W at office. The main reason was to have large sheets. It supports A3 (twice A4) sheets. It was hard to configure, but after that, it has worked fine. “Ink usage - cost of operation” is now the most common factor taken into account when thinking about a new printer! I personally have used a number of printer brands over the years and I must admit that HP has always been the most expensive when it comes to upkeep i.e. replacememnt of print cartridges - in hindsight HP would have known this already. As a matter of fact ALL printer companies know this! I do know of printers that come with added features that include a large volume ink resivour method that can be used, that obviously last a lot longer than the conventional method and is far less cheaper at the end of the day to maintain - lexmark is one such brand. Again it’s all about multifunction! if this is what you need e.g. all-in-one then you ultimately pay the price in the long run! but if your not in it for the multifuntion you can still purchase fax,scanners etc separately. One thing that must be taken into considiration is if in the event you mutifunction system needs repair, your fax, scanner and printer is a complete unit and all of it is sent off to the repair man. Overall I would have to say that for dollar value this particular model is very resonably priced for a HP printer, but I still sour at the upkeep! Maybe if HP want to lead the way so-to-speak there is no need to create such exspensive cartridges and pass the cost onto their customers! Australian = Black $20.00 Colours x 3 $51.00 Photo $27.00 total $98.00 (Genuine). I could not wait to get rid of my HP printer! It was the most difficult thing to make work. To print one letter was a half an hour of fussing with it. I went back to Canon. Easy to use, ink is average, support is great!! P.S. Buying ink online, even the name brand, is cheaper than buying it in the store. HP Multifunction Fax Printers can't multitask faxes. The biggest problem I have with HP Multifunction Fax Printers is that they cannot scan in more than one fax at a time. You have to wait for the current job to finish before you can enter a new fax. This is maddening and inefficient. Brother and Canon Multifunction Fax Printers - on the other hand - are smartly designed so that you can scan in new fax jobs while waiting for the current one to complete. They can multitask, HP doesn’t. please tell me the color are very neat,and how much for the set?and I have a printer dell 1355 cnw and yesterday I want to sent to back home scan, and for me this printer is hard to use,beside the cartridges are very expensive. sometime cheaper is not good.